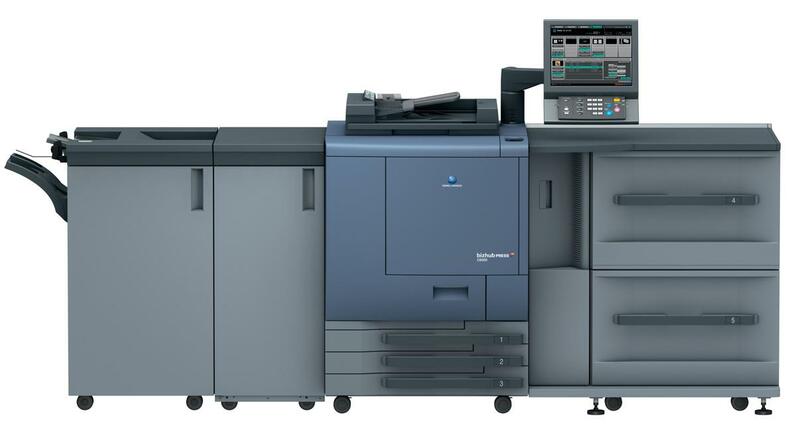 The enterprise-level Konica Minolta Bizhub PRESS C6000 is designed for serious professional printing challenges. This all in one printer, copier, and scanner has an impressive monthly cycle of 280,000 impressions and a paper capacity of 5,000-7,500 sheets. It can be customised to fit all types of printing requirements with its wide array of inline finishers and image controllers. The sleek design of the Bizhub PRESS C6000 incorporates multiples storage devices and a large LCD touch panel that makes workflow management easier. The hard-wearing and rigid body frame ensures a long life and maximum efficiency. Expect excellent prints from this Konica Minolta Printer, which uses the latest technologies in colour processing, including density control, stability monitoring, FM screening, and S.E.A.D. II imaging. It uses the Simitri HD polymerised toner and produces prints that rival offset printing in terms of efficiency. The IDC sensor and new colour control ensure consistent results throughout the entire print run. It has paper and energy saving features, including hybrid decurling, improved paper jam control, multi-feed detection sensors, and air-assisted paper feeding. The Bizhub PRESS C6000 is relatively affordable considering all its functions. However, a more advanced version of the printer (also from Konica Minolta) offers 71ppm instead of Bizhub PRESS C6000's 60ppm, and the price difference is minimal.